BBC NEWS | Business | Paul O'Neill: Careless talk? Until this week, opponents of the current US government used to snigger at Paul O'Neill. As Treasury Secretary for the first two years of the Bush administration, he was blamed for a series of gaffes - most famously when he called the catastrophic collapse of Enron "part of the genius of capitalism". However, now that he has started attacking George W Bush, this apparent tactlessness is being seen as fearless honesty. In fact, neither interpretation quite covers the facts. When Mr Bush hired Mr O'Neill in late 2000, he must have thought he'd found a kindred spirit. Like many other members of the Bush team, Mr O'Neill was a relative newcomer to politics, a businessman whose most recent achievement had been to run Alcoa, a large metals firm. In that role, he had shown his managerial muscle, most notably by pushing through an international agreement on aluminium production. In 12 years, he doubled Alcoa's global market share and more than doubled its number of workers. And he kept his feet firmly on the ground, specialising in the sort of folksy musing that passes for the common touch in American boardrooms. Billed as a "steady hand" by Mr Bush, Mr O'Neill in fact proved surprisingly wobbly. Lacking urgent projects to keep him busy (the US economy was still in pretty swell shape in 2001), he demonstrated a habit of shooting his mouth off to the nearest available microphone. 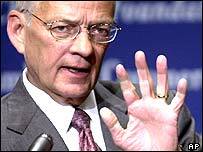 He called the US tax code "9,500 pages of gibberish", fretted publicly that Brazilians would embezzle international aid, and sent the currency plunging by appearing to deny the US strong-dollar policy. He told financial-market traders that he could learn their job "in about a couple of weeks", castigated Argentina for "continuing to consume the money of plumbers and carpenters in the US", and insisted that the safety record of the nuclear industry was impeccable - "except for Three Mile Island and Chernobyl". "If people don't like what I'm doing," he said, "I don't give a damn." This sort of behaviour made Mr O'Neill a figure of fun on the liberal left, the most prominent klutz in a notoriously tongue-tied cabinet. In fact, Mr O'Neill was not a particularly good Treasury Secretary for far more fundamental reasons. For the most part, his failing was remaining too much of a businessman to appreciate the subtleties of political issues. The crises that erupted during his tenure - first Enron, then the broader economic and market meltdown that followed - demanded someone with a deeper knowledge of international finance, not someone from the "shoot-first" school of corporate management. The importance of his gaffes, meanwhile, has been greatly exaggerated. None had lasting effects, and Mr Bush - no great verbal technician himself - never expressed the faintest dissatisfaction with him on that score. Like many of his colleagues, Mr O'Neill was hired for his plain speaking, and Mr Bush was no doubt happy to accept the rough talk with the smooth. Indeed, the personal chemistry between the two men was always said to have been excellent. It now appears, however, that that chemistry had been poisonous all along. Mr O'Neill's revelations about the Bush administration - now no longer tittered over as "gaffes" - have particular weight. He is, of course, not the first senior figure to criticise the White House. But he is the first former cabinet member to turn informer. And the fact that he is not an opportunistic politician with an eye to the next administration makes him seem especially incorruptible. But Mr O'Neill's new guise as a crusader for truth should be treated with care, too. 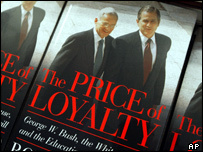 He has a book - ironically titled The Price Of Loyalty - to promote, something this weekend's news will have achieved handsomely. Mr O'Neill does not stand to earn money from the book, which is about him, not by him. But he will no doubt be interested in anything that perks up a somewhat staid retirement, enlivened only by two company directorships. Mr O'Neill is manifestly no politician. But he is political enough to realise that publicity, however controversial, has its uses.